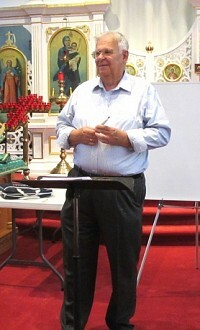 On Saturday, 19 July 2014, twenty-five people from various locations and parishes gathered at Saint Nicholas Church in Cohoes NY for “Basic Conducting: What’s All That Hand Waving About?” This music workshop, organized by the Commission on Liturgical Music [CoLM], was taught by Professor (Dr.) David Drillock -- a master teacher and conductor. It was an opportunity to learn from one of the most highly respected musicians in our church. Commission on Liturgical Music: WEBSITE LAUNCHED!